The third single from Parsely, Sage, Rosemary and Thyme might not have the instant familiarity of ‘Scarborough Fair’ and ‘Homeward Bound’ but it is a dazzler nonetheless. ‘The Dangling Conversation’ sets a sad scene of the relationship that has dissolved into apathy. Simon, all of 25 years old when he wrote this, beautifully captures the numbness of faded love. You can picture these two intellectuals, “couched in… indifference,” reading their poetry and having superficial conversations about analysis and the theater — this is 70s Woody Allen territory a decade earlier. 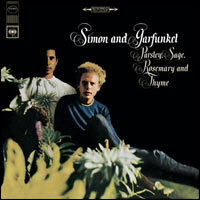 Simon & Garfunkel’s third album, Parsley, Sage, Rosemary and Thyme, was recorded and released in 1966, the same year that Sounds of Silence introduced their sound to a large audience. The new album, their third, was even more successful than its predecessor, achieving triple platinum status and sending three singles up the charts. I once came up with a scientific formula to numerially rank every CD in my collection. The idea was to assign a point value (on a scale of 1-10) to each song on each album and then divide by the number of songs on the album. This would give you a mean song-score for the whole album… basic stuff. The added wrinkle came when I tried to account for longevity. I figured it would be easy to overpraise more recent songs while a song that stood the test of time would get no boost for having done so. So I weighted the scores by adding a tenth of a point for every year since each album’s original release.